Find and book hotels. With location maps and guest reviews. Gardone Riviera is a small tourist resort on the western shore of Lake Garda in northern Italy. It lies in the province of Brescia, in the region of Lombardy. This is a good base for seeing Lake Garda - Italy's largest lake - as its location, a third of the way up the western shore, is central enough to facilitate boat travel to the other lakeside resorts. 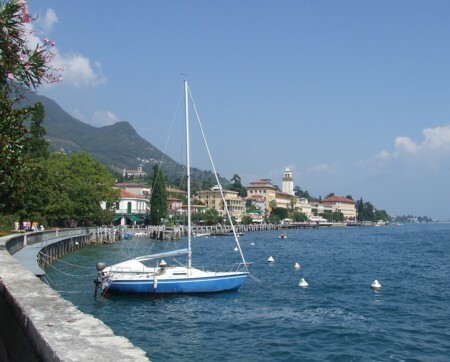 The waterfront settlement of Gardone Riviera is very much dominated by tourism, in an amiable and laid-back way. 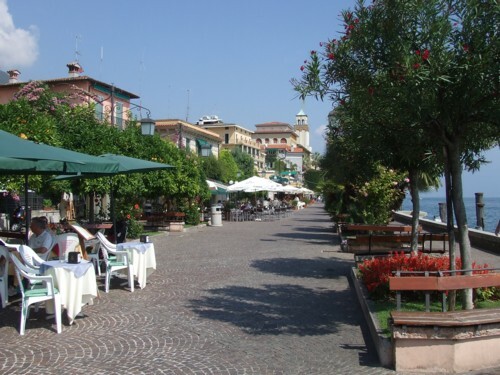 It's a small place with several hotels, a little piazza sloping down to the lakeshore and a peaceful lakeside promenade decorated with well-kept flowerbeds. Holiday-makers have a choice of places to eat and drink, and the welcoming town has lined the promenade with benches for visitors to sit and relax. This is the kind of place for lazy afternoons whiled away strolling or enjoying lake views, sipping cups of English tea and savouring extravagant ice creams at outdoors cafe tables. As well as being a comfortable place to stay, Gardone has a couple of the lake's great tourist destinations on its doorstep. The home of eccentric poet Gabriele D'Annunzio (1863-1938), which he named after an Italian military victory: Il Vittoriale degli Italiani, is just about the best tourist attraction on the lake: a pretentious, excessive and rather bonkers memorial to a very unusual Italian. The town's other prize attraction is a botanic garden, the Heller Garden, also known as the Giardino Hruska Botanico, which contains tropical plants and displays. 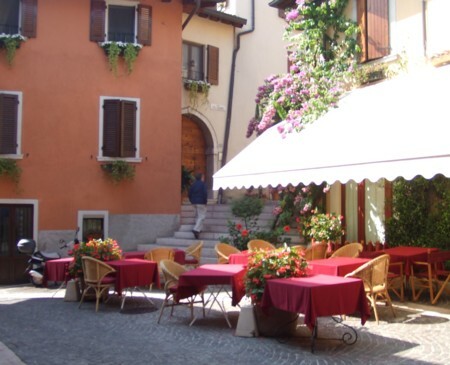 A short walk uphill from the lakeshore is Gardone Sopra ('Gardone above') a very charming old historic centre to the village, with little restaurants, courtyards, stairs and flowers. The Vittoriale is up here, and enjoys wide views over Lake Garda. This botanic garden is situated just a short walk uphill from the waterfront. The garden is also known as the Giardino Hruska Botanico after its founder, Arthur Hruska, who was the dentist of the last Tsar as well as being a botanist. He began laying out this tropical haven between 1910 and 1971, taking advantage of the sheltered spot and mild climate to plant many exotic species. Nowadays the garden belongs to a foundation set up by the artist Andre Heller, and works of modern art are dotted among the plants, pools and streams. The garden is open daily between March and October from 9am-7pm. Don't let the unwieldy name of this house/monument/fantasy put you off. The Vittoriale is a grand tourist attraction; its eccentric charms alternating between amusing, creepy and joyously bizarre. Gabriele D'Annunzio was a poet and nationalist with a love of the grand gesture (his name means 'Gabriel of the Annunciation'; he was actually born Gaetano Rapagnetta). It's often claimed that D'Annunzio was the ultimate Italian, but if so it seems a shame that his panache is so absent in conformist modern Italian society. His flamboyant eccentricity will also strike a chord with English visitors, particularly those who've visited the Sir John Soane Museum in London. He was presented with this large Liberty-style villa by the Italian State; Mussolini wanted to keep the self-styled war hero away from politics. D'Annunzio spent his time here dreaming up fantastical additions to his house and gardens, and filling the darkened rooms (bright light hurt his eyes) with his collections of stuff, from religious art (it didn't matter what religion) to the gilded shell of his dead pet tortoise. In his study, the most normal and light-filled room, he kept a bust of the Italian actress Eleanora Duse, a former lover. Her head is covered with a veil so it shouldn't distract him. Check the Vittoriale website (see links panel on the right) for the latest opening times. The complex (house, gardens, war museum) is open all year, but in the winter it has shorter opening times with lunchtime closing for the indoors sections. There are a range of combination tickets - you mustn't miss the main house (Casa di D'Annunzio or Prioria) - note that this is closed on Mondays so try to visit on another day of the week. There may be queues as the house can only be visited in small groups, on a guided tour. There are good English audio-guides which you can listen to during the Italian-language tour. Allow plenty of time for queuing, touring the house, visiting the war museum (if you wish) and exploring the grounds with their strange monuments, from an open-air theatre to a mocked-up hillside warship. Whatever your opinion of D'Annunzio, he was a man who thought big and his fantasies make good entertainment. He was buried here; his tomb dominating the nationalist memorials in a large round mausoleum he planned himself, high on the slope above the lake. Gardone Riviera is on the principal ferry routes, and it is easy to travel to and from the other Lake Garda resorts - or simply to take a pleasure cruise. There are also bus services along the western shore of the lake from Brescia, which has a budget airport - named after D'Annunzio - served by Ryanair (they call it 'Verona Brescia'): Brescia Airport. In the summer tourist season, a shuttle bus (navetta) runs between the local museums, although the tropical gardens and D'Annunzio's villa are only a short walk uphill.